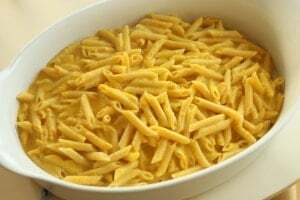 I’m pretty sure that if I let my kids choose what they wanted to eat for each meal it would be Mac n’ Cheese with 98% certainty. Personally I think that the stuff from the box is 98% disgusting. I don’t even remember liking it as a kid – but I probably did – just like every other non-discriminating child. I do remember my mom making homemade mac and cheese though. No powders involved. She still makes her own for my kids when they go over to her house. So it got me thinking – if I have to make this for my kids occasionally anyway, I want to make an adult version that is deeelicious – yet still somewhat healthy. And this is what I came up with. My husband LOVES cheese. And love is almost an understatement He loves every kind of cheese. Even the really sharp weird looking ones with mold growing all over them. Because of his love for cheese, it has expanded my cheese palate. I definitely don’t love every cheese, but one that I do love is Gouda. It has a very creamy smooth texture to match its flavor. Delicious. That was my cheese of choice in this dish and will be the star. 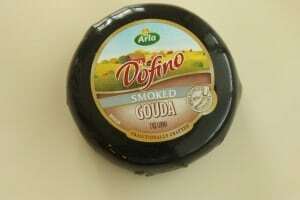 Oh, and this isn’t just any Gouda – it is smoked……. Begin my sauteeing and onion and 3 cloves of garlic in a bit of olive oil, until the onions are translucent and have softened. Add to your pan 1 cup of plain Greek yogurt, and 1 cup of pumpkin puree. Let this simmer for a minute or two and then add 1 cup of chicken or vegetable broth. Simmer this for another couple of minutes so that everything gets nice and creamy. Salt and Pepper to taste. Oh, and I also added some Smoked Paprika. Next add your shredded Gouda. Before you add your cheese there is a VERY important step. If you don’t follow this step you will not have smooth sauce. 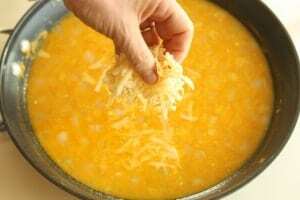 After you shred your cheese, but before you add it to the mixture, toss it in a bowl with a little bit of flour. 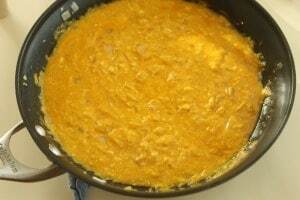 This will help the cheese incorporate and make your sauce smooth and creamy. One recipe I found called for half Gouda and half sharp cheddar. I put more like 3/4 Gouda and 1/4 sharp cheddar. Stir until melted. Cook about a 13 ounce package of pasta according to the package directions (al dente). 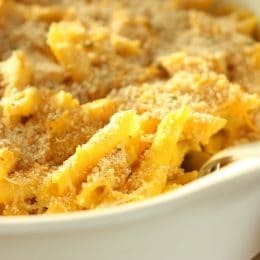 Once the cheese is melted and the sauce is smooth, combine it with your cooked pasta. 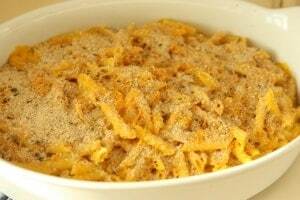 Sprinkle with additional cheese and breadcrumbs. Bake in a 375 degree F oven for 12-15 minutes. The cheese should be bubbly and the top beginning to brown. Then serve up big spoonfuls to yourself………and your kids if you must share. Who said adults can’t like kid food?? Cook pasta al dente, according to package directions. Dice onion finely, and mince garlic. Heat 1 tablespoon olive oil over medium heat in a large sauce pan or dutch oven. 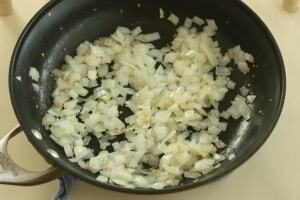 Add onion and garlic and saute for a few minutes until the onion is translucent. 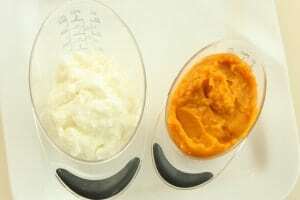 Add the pumpkin puree and plain yogurt, stir until smooth, cooking for a minute. Turn the heat down to medium low. Pour in the chicken broth and paprika, stir until smooth, cooking for 3-5 minutes. Shred both kinds of cheese, and keep separate. In a bowl, toss the flour and the Gouda cheese together. Then add in all of the Gouda cheese to the sauce. Reserve the 1/2 cup sharp for later. Stir until melted. Add cooked pasta to sauce, tossing gently to combine. Spoon into a baking dish. 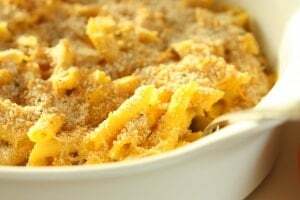 Top the pasta with the remaining cheddar cheese, and breadcrumbs. Bake for 12-15 minutes and serve. 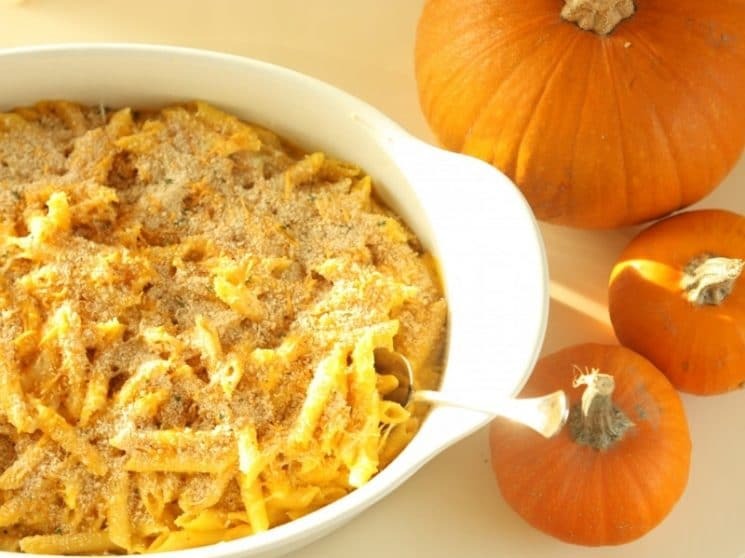 I have lots of leftover pumpkin and this is one recipe sure to be added to my menu for thanksgiving. I didn’t think that pumpkin can also be made into sauce. If I don’t get to buy gouda, could I just replace it cheddar? 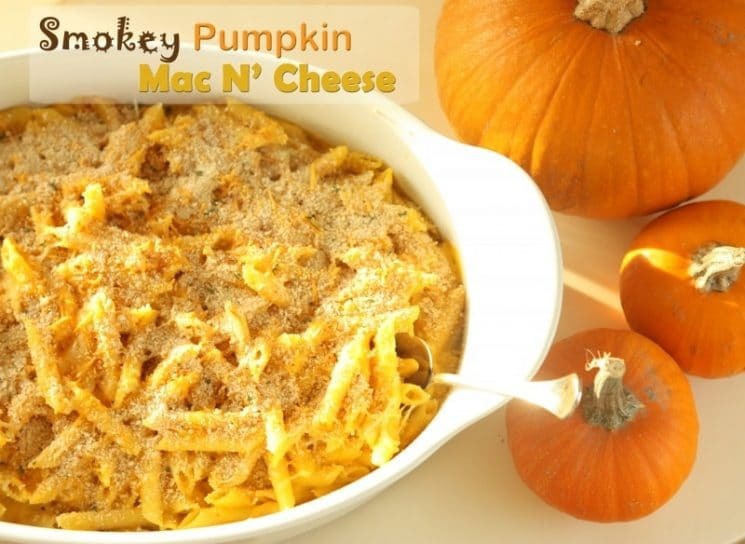 This looks so good, it actually inspired me to make a smokey pumpkin risotto which turned out great! Yes you can definitely replace the gouda with cheddar – it will just have a slightly different flavor. I bet the risotto was delicious! What is the exact name and brand of Greek yogurt that you used in this recipe? I used canned sweet potato instead of pumpkin and probably shouldn’t have. .. The consistency wasn’t quite the same. Going to use regular paprika cause it was cheaper. Using a 12 oz box of macaronni noodles cause there was not a 13 oz box. Also only using 2 cups of gouda cause it only came as a 8oz package and I was not going to spend another $6 . Can you make everything ahead and bake later? The Smoked Paprika is part of the “Smoky” flavor, along with the smoked gouda. The sharper the gouda, the better the flavor, I found, too. Smoked paprika is in the same ‘family’ as regular paprika. It’s made from pimiento peppers that have been dried and smoked over an oak fire, then ground into a fine powder. Yep – you can put it in your fridge and bake it when you need it. Wow. I’m pretty sure you didn’t intend to come across as incredibly snobbish with the non-discriminating comment, but you managed to do it nonetheless. Paula – I’m not really sure what you are referring to. Can you clarify? I’m way late to this party, but I have questions about the ingredients: The walkthrough instructions say 13 oz of pasta and 1 cup of yogurt. The ingredient list says 24oz pasta and 1oz yogurt. Can someone clarify?